There are so many choices for your wedding flowers, bouquets and all the trappings that it's easy to get lost. Give your tables a special country look with the perfect centerpiece. Whether it's made from flowers, fabric or moss, it should be topiary. You may want to tackle this project yourself, so you need to keep it simple using easy to find materials that won't break the budget or your sanity. You can't get much easier or more effective than using pine cones or burlap, which have the added bonus of giving that rustic country ambiance. There are many ways of achieving the elegant look, from using some of the same flowers, silk or real, as those in your bouquet or other flowers. 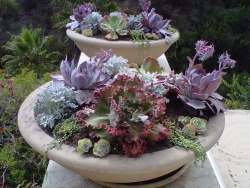 Or, go totally the opposite way and use succulents. Follow Drought Smart Plants's board Topiary Wedding on Pinterest.